Singapore Airlines A380 9V-SKB being unloaded at Delhi airport. Photo copyright Bangalore Aviation. Bangalore Aviation has always promoted the wearing of seat-belts when seated on-board an aircraft. An incident on-board a Mumbai bound flight highlights our safety campaign. On Saturday October 18, 2014, at around 21:30 IST (16:00Z) approximately 30 minutes before arrival, a Singapore Airlines A380-800 9V-SKJ performing flight SQ424 from Singapore to Mumbai with 408 passengers and 25 crew on-board, suffered sudden severe turbulence during descent into Chhatrapati Shivaji airport without warning. As per the airline spokesperson, eight passengers and 14 crew sustained injuries. The flight landed safely at the airport and the injured were treated by medical personnel on arrival. It is not clear if anyone required hospitalisation. We assume all the 14 crew injured were cabin crew since the flight crew is routinely strapped in their seats when seated. 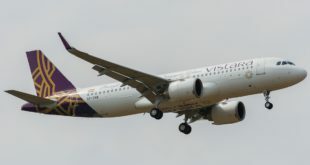 Update: The airline responded (see full statement at the end of the story) to our follow-up questions after publication of this story and clarified – 10 of the 14 injured crew required hospitalisation but they have been cleared and discharged. All eight injured passengers were hospitalised. Six have been examined and discharged. The airline issued a statement [bsu_quote cite=”Singapore Airlines spokesperson”] “Singapore Airlines flight SQ424 from Singapore to Mumbai experienced sudden turbulence during descent on 18 October. There were 408 passengers and 25 crew on board. 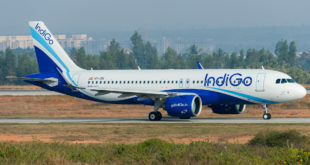 Eight passengers and 14 crew sustained injuries and were attended to by medical personnel on arrival at Mumbai Airport. Our immediate concern is for the well-being of our passengers and crew. 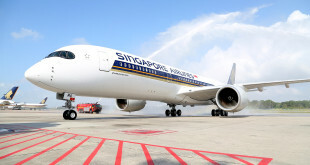 Singapore Airlines will provide full assistance to the authorities in their investigations. [/bsu_quote] The airline did not clarify the disposition of the crew. Mumbai is a rest-stop destination for the airline and crew changes for the return flight. It is remains unclear whether the injured crew returned back to Singapore immediately (i.e. ealy this morning) or stayed back in Mumbai with the rest of their crew-mates and will return early tomorrow morning. One would also assume the airline would send extra crew from Singapore to perform the duties of the injured crew for the return flight SQ423 early tomorrow morning. The exact status of 9V-SKJ remains unknown. It it did perform the return flight SQ423, so we know it was not grounded at Mumbai. We learnt from the airline later, that the return flight was delayed by 53 minutes to deal with the injuries, clean up the aircraft and complete the needed formalities. One can be sure the SIA Engineering would repair the A380 through today at Singapore, and deploy it by afternoon or late evening. Photos sourced by Bangalore Aviation show damage to the overhead panels inside the aircraft, toilets and galley area. It shows how passengers would have been flung upwards striking their heads and torsos on the panels, and keep in mind the A380 is the world’s largest jetliner. Nature does pack a pretty powerful punch. Singapore Airlines SQ424 turbulence damage. Singapore Airlines SQ424 turbulence damage. Toilets. Singapore Airlines SQ424 turbulence damage. Overhead bins. The airline responded to follow-up questions. Q. Did any of the injured require hospitalisation? -Of the 14 crew, 10 required hospitalisation. They have been cleared and discharged by the medical personnel. – All 8 passengers were hospitalised and 6 have been discharged by the medical personnel after examination. Q. What about the injured crew? Did they return back to Singapore or are they resting in Mumbai? Since BOM is a rest-stop destination, Will SQ [Singapore Airlines] send additional crew on tonight’s flight to supplement the injured crew for the return flight? A. We are unable to share these details with you for crew confidentiality reasons. All of us at Bangalore Aviation wish all the injured a quick and safe recovery.